G. Juanita Greenquist, 95, of Topeka, passed away Wednesday, January 16, 2019, the daughter of Oscar and Cassie (Martin) King. She was born September 24, 1923 in Topeka, Kansas. She was employed by the Santa Fe Railroad for 41 years, retiring as a clerk in 1985. She was a member of the First United Methodist Church where she was active in the Women’s Group and the Togetherness Sunday School Classes. She was a member of the Santa Fe Old Tenner’s Club, N.A.R.F.E. Union and the Highland Park Solo’s. She loved reading, applique quilting and working in the yard. She also loved to travel and took trips every year. 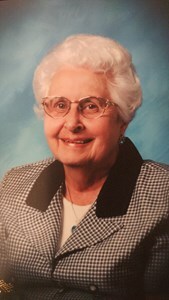 She married Russell "Swede" Greenquist on May 16, 1948 in Topeka, Kansas at the First United Methodist Church. He preceded her in death on September 23, 1980. Survivors include a brother, Oscar (Violet) King, sister-in-law, Leta King and numerous nieces and nephews. She was preceded in death by her, sister, Murel (Kiah) Wyatt, brothers, Lee (Ann) King, Elmer (Clara) King, Harold (Elise) King, Alvin (Maddy) King, Bob King and her parents. A Funeral Ceremony will be at 1:30 pm., Wednesday, January 23, 2019 at the First United Methodist Church, 600 SW Topeka Blvd., Topeka. Interment will follow at Mount Hope Cemetery & Funeral Chapel, in Topeka. Memorial contributions may be made to First United Methodist Church 600 SW Topeka Blvd. Topeka, KS 66603. Add your memories to the guest book of Juanita Greenquist. A lifetime of memories of a woman who loved life and freely gave advice and opinions unsolicited and solicited. Her smile and laughter were infectious. Her words taught me that not only what you say, but how you say it matters. Her generosity and efforts to keep a far flung family connected are most appreciated. May we all remember and try to live up to the best she had to offer. I shall miss her. I shall miss her laughter, her quick wit, her stories-both those told and untold, her resilience and much more. Farewell for now, Aunt Juanita. What a beautiful, vibrant woman who lived and loved for almost a century's time. I will miss her sly sense of humor, and her smile that showed up when you least expected it, and sent everyone into peals of laughter. I have so many beautiful memories of Aunt Juanita. She's finally together with Uncle Swede again. I hope she's wearing red shoes! I love you, Aunt Juanita! Juanita lived down the street from my Mom and Dad for many years. She was such a nice, sweet person. Big heart! I loved visiting with her and listening to her stories. Rest in peace!